Love this Retrocrush classic post on the Worst Halloween Costumes of All Time. Anyway, Retrocrush found some classic costumes from the 1970s-1980s, and wrote hilarious captions for them. Father Murphy! Mis-tah Kot-tah! Chachi! Jaws! Vicci the creepy robot child from "Small Wonder!" But I do think their best caption is this one, for the Rubik's Cube costume: "How many poor kids that got stuck with this one had to hear, "Hey Rubik, how about if I rearrange your face?" This very well may be the least popular costume of all time, 2nd only to the failed Parcheesi costume of 1974." FYI, the Rubik's Cube costume is popular again, though the homemade ones are much cooler than this ready-made version. We didn't have the nice store bought costumes back in the 70's, so it was either plastic sheet with plastic mask boughten costume or homemade. Most kids went homemade. I remember a lot of princess Elias. I was a jawa made from an old brown blanket and my dad used a jigsaw to cut a piece of wood into a blaster shape. My sister was an awesome Sandperson (also Star Wars). There were also a lot of R2D2's. Cowboys, gypsies, lumberjacks, brides were also common as they are easy to make costumes. In the '70s, most kids I knew had store-bought costumes, simply because back then, Halloween was strictly for little kids. No one over the age of 10 would have been caught dead trick-or-treating. For the big kids, it was all about Mischief Night (Oct. 30) and going out with soap, toilet paper and shaving cream (and maybe even firecrackers if you could swing them), and smashing a pumpkin or two. These days, the cops have pretty much stamped out Mischief Night, so the older kids trick-or-treat once more. 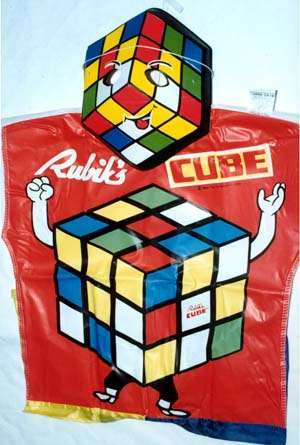 I actually did a homemade Rubiks cube costume back in the 80s-- similar to the boy's costume that you linked to-- and won a costume contest! I LOVED Halloween as a kid (and still do) and would start thinking costume ideas as soon as school started.